EnSite Safari Suite® is a powerful multi-commodity energy management software solution built to accommodate the entire life cycle of the consumer. It is designed to enable growth for energy companies and service providers through a scalable platform and increased back room efficiency. EnSite Safari Suite provides access to information in one system to improve financial and operational decisions. Safari allows EnSite customers to reduce transaction costs, improve cash flow, preserve margins, and expand their business without the need to expand their staff. Safari CIS (Customer Information System) improves customer management capabilities by providing a centralized view of customer information. Representatives have real-time access to contact information, billing history, account properties, contract and pricing information, accounts receivable status, historical usage and much more—all from a single interface. Safari CIS helps improve customer retention by enabling you to provide outstanding real-time service. This includes tracking customer contact events and assigning specific user or department follow-up on each unresolved customer issue. Safari CIS helps facilitate growth in customer base through tracking prospect/sales activities and managing sales commissions. Safari CIS provides an intuitive, efficient dashboard for customer management, which translates into a competitive advantage through accurate and timely customer service. Three-tier Customer Hierarchy for Corporate/Billing/Service Locations. Improve response time to customers with quick access to all customer enrollment, communications, and account detail information. Reduce confusion between customers and service representatives with the ability to view the invoice exactly as it appears to the customer. Improve customer satisfaction by ensuring proper tracking and handling of follow-up commitments. Increase and manage customer base with electronic import/export of utility enrollment and transaction files for adds, drops, terminations, etc. Improve decision making with access to complete historical usage. 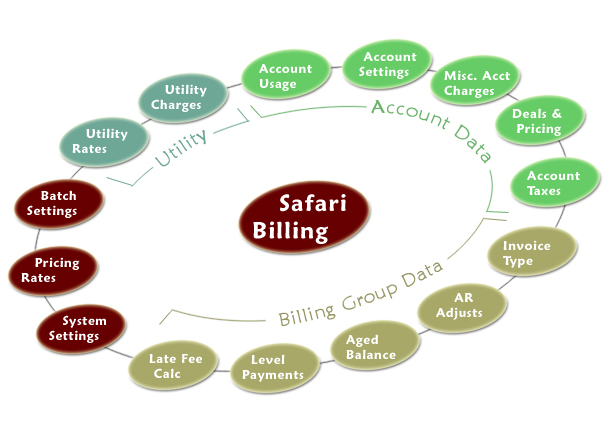 Safari Billing improves cash flow and customer retention through accurate and timely billing. The system supports innovative and flexible pricing products for commodity customers. With Safari Billing, invoicing complex pricing schemes involving tiers, trigger options and contract settlement becomes a seamless and automated process. 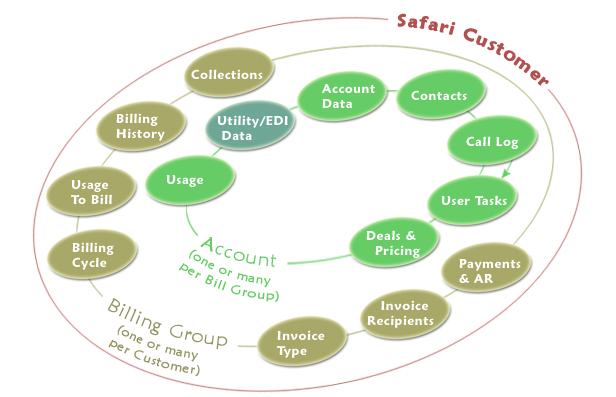 Safari Billing is a multi-commodity, customer-driven billing system developed specifically for the energy industry. Safari Billing improves cash flow and customer retention through accurate and timely billing. The system supports innovative and flexible pricing products for commodity customers. With Safari Billing, invoicing complex energy pricing products involving tiers, trigger options and contract settlement becomes a seamless and automated process. EnSite Safari Suite embodies flexibility, supporting residential, small business and large Commercial/Industrial customers in one system. The billing module invoices on estimated or actual volumes and manages level payment plans. Generate estimated distribution charges based on tariff logic specific to each utility or pass through actual Utility charges on a consolidated invoice. Integrate data and processes across systems, including processing relationships with internal and external third parties such as accounting systems and utilities. Publish invoices using adaptive and user-friendly invoice formats utilizing Crystal Reports. Safari Billing helps EnSite clients distinguish themselves from the competition through custom invoice publishing options. It provides the flexibility necessary to operate in varied utility markets with automated processing based on established business rules, in addition to providing consolidated utility billing options. Complex pricing and contract options including indexed, fixed, caps and collars, pricing triggers, etc. Expand into any utility market with support for all single and consolidated billing options. Help customers budget their energy costs by offering level payment plans. Reduce invoicing errors by previewing invoices exactly as they will appear when printed. Expand product offerings with unlimited types of invoice charges (both one-time and recurring). Save time, maximize human resources and improve cash flow with flexible billing cycle options. Increase customer satisfaction with flexible invoice details and distribution options (paper, electronic, third party). Maintain complete invoicing flexibility by creating manual invoices which automatically update A/R. Safari EDI provides automated transaction management and validation for incoming and outgoing transactions, with robust features for user review of EDI functions, fully automated file transfer, automated invoicing, and much more. EnSite Safari Suite is designed to manage high-volume data transactions in and out of the system for Utility EDI processing. To accomplish this, the software features a specialized Utility Data Interface (UDI), file import/export protocols, and data validation protocols to support processing of standard EDI transactions between the energy marketer and utilities in their operating regions. This UDI component allows the definition, import and export of data related to common utility-marketer transactions, including enrollment, metering, billing, payments, and others. It utilizes a common XML data interface format, which can be mapped both incoming and outgoing to virtually any defined file format. EnSite converts EDI data to and from the Utility format by way of your third-party EDI provider. 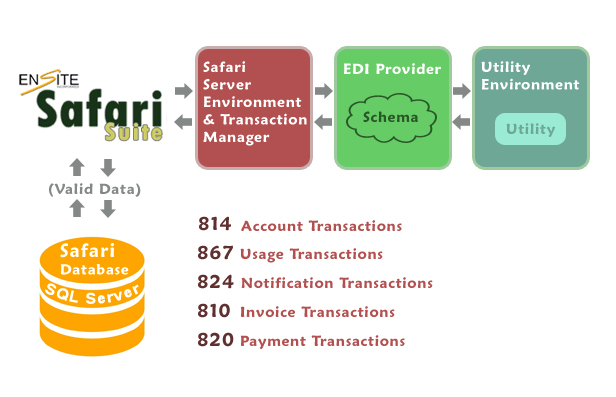 Incoming Utility transaction files (XML or Text files) received from the EDI provider are automatically processed in the EnSite Safari Suite® server environment to ensure valid data has been received, with exceptions managed by the user at the software’s Utility Data Interface screens for review and, if applicable, re-processing into the Safari database. For outgoing transactions, EnSite Safari Suite® processes day-to-day account management and billing functions into transaction files staged for export at the main UDI screen. These files are then exported to the EDI provider for translation into the appropriate Utility file type for validation and processing on the Utility end. Using this process, the EnSite Safari Suite® user has the ability to manage high-volume transaction data into the Safari system to, for example, enroll accounts, change account data, populate historical usage, record payments, process Utility Rate Ready invoice data, etc. For export, the system will prepare high-volume enrollment, change, and drop requests; and Bill Ready invoice data. The Safari Utility and Gas Management system is a nomination, balancing and supply management system built for the diverse operating rules of any utility market. The Safari Utility and Gas Management system is a nomination, balancing and supply management system built for the diverse operating rules of any utility market. Safari Gas Management saves time and reduces errors by integrating and automating the processes of forecasting, meter data collection, daily/monthly balancing, storage management and optimization, and nominations. Safari Gas Management helps EnSite clients avoid penalties by incorporating utility-specific operating rules along with automated balancing processes. The system saves time and optimizes energy purchases with automatic load forecasting and weather normalization. It helps increase profits by extracting the maximum value from balancing and storage assets in applicable utility markets. Safari Gas Management reduces back office transaction costs and improves response time to dynamic market conditions. EnSite Safari Suite® provides a comprehensive and flexible platform for gas management, which translates into a competitive advantage through agile, accurate and timely operations. Eliminate costly data entry with automated utility data interfaces. Optimize margins and assets with tariff logic for storage planning, volume balancing, critical day management and penalty avoidance. Reduce forecasting time and optimize energy purchases through automated load profiling/weather normalization by nomination group or account. 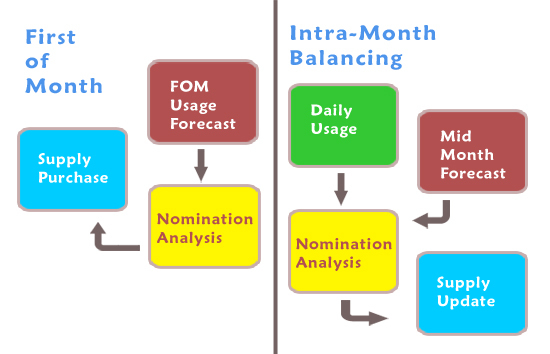 Produce accurate daily forecasts to minimize imbalances using a predefined weekly pattern. Save time by setting up strategies for automatic nomination recommendations. Prevent errors with automatically generated nomination reports (i.e. paper, fax, electronic). Improve data integrity by securing nominations prior to a selected date. Save time by prorating and allocating volumes automatically by utility and pipeline. Improve gas operations management tools with a summary view of utility and nomination groups. Improve account management by tracking notes of customer communications and operational decisions. Improve cash flow and customer satisfaction using tariff models for tariff billing, estimating distribution charges and creating savings reports. Safari supports complex Windows® Services interactivity, EDI transaction management and translation, and other services to communicate with third party systems. EnSite built the EnSite Safari Suite® application to accommodate data interfaces with multiple business partners as well as client internal applications. The application contains a generic file import/export component to potentially allow the implementation of any type of data interface operation. EnSite has a proven track record of implementing effective communications between EnSite Safari Suite® and third-party business systems. This is typically achieved by designing and implementing special Windows Services to instruct EnSite Safari Suite® on interactions with third party systems. For service-based integration, EnSite has developed services enabling EnSite Safari Suite® to communicate with third party systems such as accounting software, EDI vendors, trading systems, credit bureaus, sales automation systems, and published rate feeds (such as a NYMEX feed). Other ‘standard’ EnSite Safari Suite® services allow automated invoice delivery via E-mail to designated recipients, and automated invoicing of imported Usage records for mass markets (EDI). Today, EnSite Safari Suite is working in tandem with systems from Peachtree, JD Edwards, Lawson, Endur, Entegrate, Sales Force.com, Prophet X, E-Signal, Wells Fargo, Bank of America, EDS, and national EDI vendors. On the whole, the features and capabilities of Safari Suite comprise an impressive amount of inter-system communication and automation, resulting in time saved, errors avoided, and ease of records management and archiving. The EnSite Safari Suite application provides robust report generation, customization and distribution options for screen-based reporting, system and security reports, and invoicing of customers. The reporting interface provides user-friendly functionality, from the system level of database-driven report assignments and security reporting to end-user report generation and review at the main interface. When reports are generated at any level of the system, the on-board report viewer provides easy navigation and data review, as well as a wide variety of report export options. Click the image for a larger view of a sample Safari report. EnSite Safari Suite® Invoices are created and printed similar to reports. At the System Administration module, the Administrator may design Invoice Templates based on an existing Crystal Report, which is developed by the user or by EnSite. 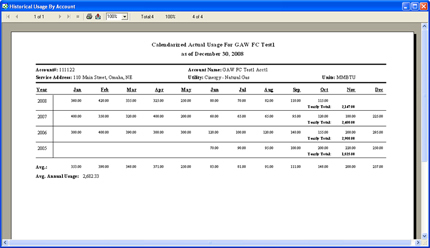 These Invoice Templates are then available for assignment to accounts. The Administrator may also assign “sub reports” to an Invoice template. These reports will be automatically printed along with the Invoices at billing time. Invoices are available for production in various formats. The printed Invoice created at billing can printed on your local printer, or it may be outsourced to a third party for printing. Users may also export file-based versions of Invoices, in the same way that other reports may be saved to a file type.